Human ethnocentrism—the tendency to view one's group as centrally important and superior to other groups—creates intergroup bias that fuels prejudice, xenophobia, and intergroup violence. Grounded in the idea that ethnocentrism also facilitates within-group trust, cooperation, and coordination, we conjecture that ethnocentrism may be modulated by brain oxytocin, a peptide shown to promote cooperation among in-group members. To survive and prosper, individuals need groups whose members contribute information and resources. Because contributing resources and information makes oneself vulnerable to exploitation by others, group members need to know who to trust or to distrust, who can be expected to also contribute to the group and to reciprocate cooperation, and who may abuse in-group generosity and free-ride on others (1). A key mechanism facilitating such in-group cooperation is ethnocentrism, the tendency to view one's own group as centrally important and as superior to other groups. Ethnocentrism manifests itself in positive valuation of (members of) one's in-group. Such in-group favoritism signals loyalty and positive commitment to the group, thus rendering the ethnocentric individual a reliable and trustworthy partner. Ethnocentrism may also show up in negative valuation of (members of) out-groups. Such out-group derogation signals to in-group members who should be excluded from in-group resources and exchanges, and reduces the probability that in-group resources are inadvertently extended to out-groups (1–6). Baby Oxytocin by Cordelia Cembrowicz - Ink on paper - Head bands and vest labels show the atomic representation : Carbon = Men (4 bonds), Women = Oxygen (2 bonds), Hydrogen = Children (1 bonds), Nitrogen = Mixture (3 bonds), Sulphur = Gymnasts (2 bonds). If in-group favoritism and out-group derogation have adaptive value and sustain in-group functioning, coordination, and cooperation, it follows that (i) throughout evolution those individuals who displayed in-group favoritism and out-group derogation and who detected such tendencies in others were more likely to spread than individuals lacking these capacities (5–8) and (ii) the human brain may have evolved to sustain ethnocentrism through yet-unknown neurobiological systems. Here we conjecture that human ethnocentrism may be motivated by brain oxytocin, a peptide that is produced in the hypothalamus and released into the bloodstream from axon terminals and into the brain from dendrites of hypothalamic neurons (9). 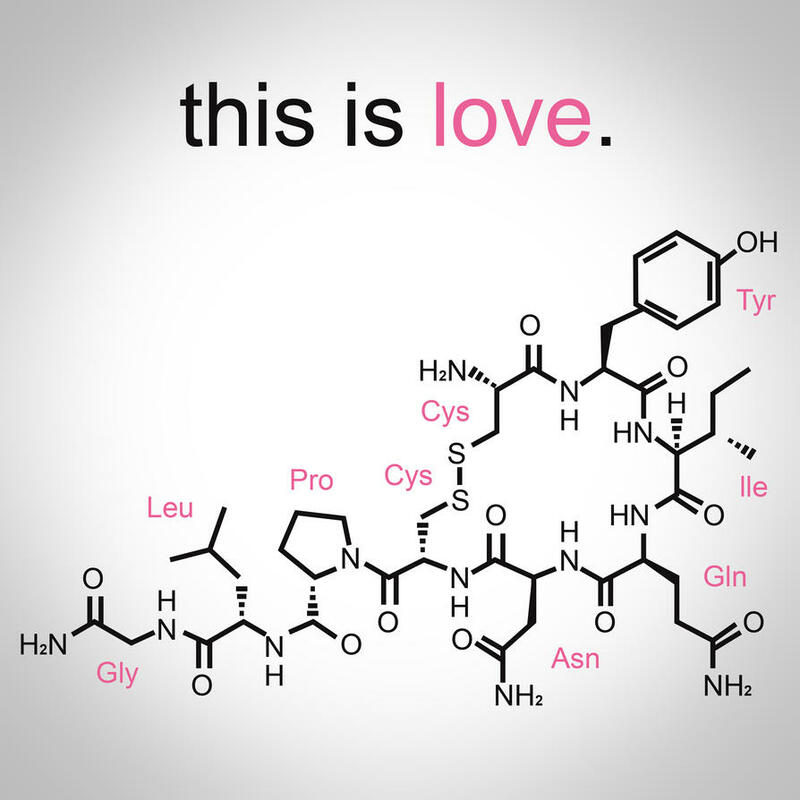 Functioning as both a neurotransmitter and a hormone, oxytocin's targets are widespread and include the hippocampus and the amygdala (10–12). Oxytocin interacts with dopaminergic, reward-processing circuits in the nucleus accumbens shell and in the ventral tegmental area (13) and exerts anxiolytic effects via direct activation of oxytocin receptors expressed in serotonergic neurons of the raphe nuclei (14, 15). Animal studies have implicated oxytocin and vasopressin in social bonding, physiological stress responses, and wound healing. In humans, endogenous oxytocin and vasopressin levels covary with perceptions of relationship quality, marital behaviors, and physiological stress responses. To investigate relationships among marital behavior, oxytocin, vasopressin, and wound healing, and to determine the characteristics of individuals with the highest neuropeptide levels, 37 couples were admitted for a 24-hour visit in a hospital research unit. After small blister wounds were created on their forearm, couples participated in a structured social support interaction task. Blister sites were monitored daily following discharge to assess wound repair speed. Blood samples were collected for oxytocin, vasopressin, and cytokine analyses. Higher oxytocin levels were associated with more positive communication behaviors during the structured interaction task. Furthermore, individuals in the upper oxytocin quartile healed blister wounds faster than participants in lower oxytocin quartiles. Higher vasopressin levels were related to fewer negative communication behaviors and greater tumor necrosis factor-α production. Moreover, women in the upper vasopressin quartile healed the experimental wounds faster than the remainder of the sample. These data confirm and extend prior evidence implicating oxytocin and vasopressin in couples' positive and negative communication behaviors, and also provide further evidence of their role in an important health outcome, wound healing. That oxytocin and anxiety may be linked in some way in the modulation of social bonding is supported also by scattered data showing that a moderate level of stress seems to promote pair bonding in different species, including human beings . Pursuing this line of thought, romantic relationships, and perhaps social relationships in general, could be interpreted as amounting to stress conditions, both acute and chronic depending on the phase . The role of oxytocin would seem generally to be that of keeping anxiety levels under control to a point where they are no longer harmful (in fact, low oxytocin concentrations have been linked with pain syndromes, such as fibromyalgia  or abdominal pain , but may nevertheless lead to such strategies and behaviours as are best suited to ensure a partner's continued proximity both during the first stages of the romance and subsequently. Oxytocin might thus be considered an essential element in securing the rewarding effects of a romantic relationship, as a result of its increasing a prospective sexual partner's willingness to accept the risk deriving from social contacts , through the modulation of anxiety mechanisms perhaps at the level of amygdala . Of course, with particularly vulnerable individuals, if excessively affected by the relationship itself or by other events, these delicate mechanisms might be maladaptive, in the sense that such subjects might become too anxious and thus cross the line between normal and pathological states, even to the point of developing a full-blown psychiatric disorder .. It seems that the emotions of Love, Loss and emotion can all be invoked directly with brain chemicals, and medical cases where people have suffered brain damage, or are genetically incapable of producing or reacting to certain neurotransmitter chemicals enables us to pinpoint which emotions are caused by which neurotransmitters. As a result there is a huge catalogue of chemical treatments for various brain disorders. Oxytocin is responsible for the loving, soothing tingly feeling we get in response to physical contact with a person whom we are attracted to physically. Dopamine is a hormone that allows oxytocin to be produced, and in a relationship Dopamine is released (through simple psychological association) by thinking about the person we love, or smelling them, or being aware that they are around. It is this association that creates the deeper-than infatuation love we associate with the person - and thus stimulates the production of the mind-chemical phenylethylamine which causes a feeling of bliss. It is phenylethylamine which makes us want to reproduce the event, such as being with that person. People who have less oxytocin receptors, or a reduced ability to produce dopamine develop less relationships and do not become "settled down" in an relationship. Oxytocin production can be artificially stimulated with Dopamine - causing a second-class sort of euphoria that is not associated with any particular person other than the current surroundings or situation. It is the association between person and oxytocin-euphoria that creates the deeper feeling of satisfaction which results from succeeding in obtaining what you are biologically programmed to want - human company and love. This positive-feedback system is also found in species of animals that form long term relationships. The case of Clive Wearing shows that there is nothing extra required to cause such stimulus other than biochemistry, and because he cannot form new memories the presence of his wife will always create the happy-excitement response because he is unable to learn that she has not been away for very long. If there was a soul, surely it would not be so easily fooled! But fooled it is, and it seems that in every way, even with our most important emotions, biochemistry rules supreme. Author / Source: Vexen Crabtree - Emotions Without Souls - How Biochemistry and Neurology Account for Feelings. Oxytocin appears to be the reason stressful social situations, perhaps being bullied at school or tormented by a boss, reverberate long past the event and can trigger fear and anxiety in the future. That’s because the hormone actually strengthens social memory in one specific region of the brain, Northwestern scientists discovered. If a social experience is negative or stressful, the hormone activates a part of the brain that intensifies the memory. Oxytocin also increases the susceptibility to feeling fearful and anxious during stressful events going forward. The findings are important because chronic social stress is one of the leading causes of anxiety and depression, while positive social interactions enhance emotional health. The scientists discovered that oxytocin strengthens negative social memory and future anxiety by triggering an important signaling molecule — ERK (extracellular signal regulated kinases) — that becomes activated for six hours after a negative social experience. ERK causes enhanced fear, Radulovic believes, by stimulating the brain’s fear pathways, many of which pass through the lateral septum. The region is involved in emotional and stress responses. The findings surprised the researchers, who were expecting oxytocin to modulate positive emotions in memory, based on its long association with love and social bonding. said Yomayra Guzman, a doctoral student in Radulovic’s lab and the study’s lead author. The new research follows three recent human studies with oxytocin, all of which are beginning to offer a more complicated view of the hormone’s role in emotions. The nonapeptide oxytocin is considered beneficial to mental health due to its anxiolytic, prosocial, and anti-stress effects. Unexpectedly, evidence for anxiogenic actions of oxytocin in humans has recently emerged. Using region-specific manipulations of the oxytocin receptor gene (Oxtr), we identify the lateral septum as the brain region mediating fear-enhancing effects of Oxtr. These effects emerge after social defeat, and engage Oxtr distinctively coupled to the extracellular signal-regulated protein kinase pathway. The established view that oxytocin reduces fear and anxiety1–3 has recently been challenged, as humans given oxytocin intranasally show increased recollection of aversive events4 and startle responses to stressful stimuli5,6 Consistent with these data, oxytocin reactivity is associated with increased post-conflict anxiety7. The adverse effects of stress on emotional behavior have been linked to distinct signaling pathways17. Our results demonstrate that social defeat significantly activates the lateral septal Oxtr/Erk pathway and thereby enhances contextual fear conditioning. This mechanism may underlie the unexpected anxiogenic and fear-enhancing effects of oxytocin in humans4–7 and mice19, as opposed to anxiolytic actions mediated by the central amygdala20. We therefore propose that rather than displaying a unidirectional influence on anxiety, the oxytocin system plays a modulatory role, possibly by changing the salience or emotional valence of social and nonsocial contexts. This could improve the cognitive tuning of emotional processes and thus provide superior behavioral adaptation. Vexen Crabtree - Emotions Without Souls - How Biochemistry and Neurology Account for Feelings.